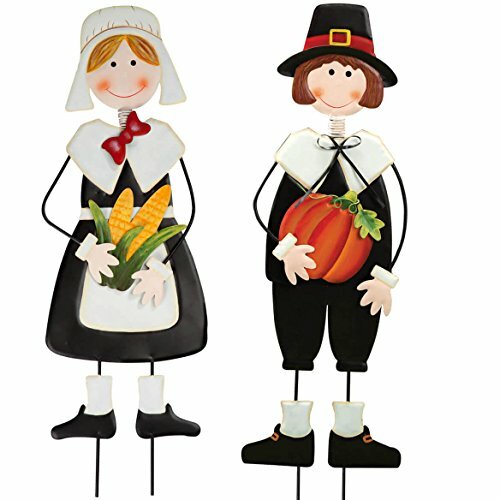 Bringing the joy of Thanksgiving home, these delightful pilgrim boy and girl metal yard stakes by Maple Lane CreationsTM add unique charm and personality to your holiday decorstaking easily into lawn or garden, planter or hay bale. Boasting exceptional craftsmanship from their detailed pilgrim outfits to the harvest gifts they carry, this metal yard art set is sculpted of hammered, painted metal with a coiled neck which allows their heads to sway in the autumn breeze. Easily assembling in seconds, these pilgrim decorations measures 28" high each with stake. If you have any questions about this product by Miles Kimball, contact us by completing and submitting the form below. If you are looking for a specif part number, please include it with your message.